What Is the Importance of Lava Rock in Organic Gardening? Lava rock has many uses in an organic gardening. Its use can impact how plants grow, and the amount of work a gardener has to put in. Lava rock is a form of igneous rock called scoria that is created by the eruption of volcanoes. Scoria is formed when the molten lava spewed from a volcano solidifies with air in bubbles still trapped inside. This makes scoria or lava rock lighter and is the reason for bubbled shaped holes in the rock. Lava rock can be brownish red, black, or grey. Being natural in origin, it is suitable for use in organic gardens as mulch and for landscaping, and does not have any environmental impact like artificial mulches do. It can be purchased at most home and garden stores. Gardening expert Lisa Hallett Taylor describes herself as "an environmentally conscious landscape designer" and has insight into lava rock use. Hallett Taylor is no stranger to mulches, as she is a published author and expert who specializes in landscaping, home and garden, antiques and collectibles. She's written for the Los Angeles Times, contributes to Houzz and Laguna Beach Magazine, and other respected publications. "Lava rock is excellent as a mulch because it lasts a long time," Hallett Taylor said, adding, " It doesn't break down--like bark." Lava rock is an inorganic mulch since it comes from the earth, but like any other kind of organic mulch, lava rocks helps keep water in the soil and keep weed growth down. However, lava rock absorbs heat during the day, and releases it at night, thereby increasing water loss. Plants that do not like these conditions should not be used with lava rock explains North Caroline Cooperative Extension Service (NCCES pg. 16). 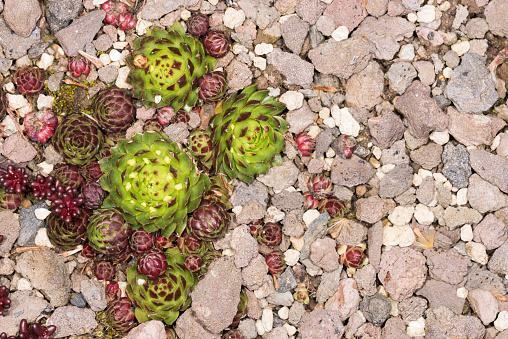 Since their coarse size provides good drainage, lava rock is also suitable for plants that do not like waterlogging, like succulents, and for low-lying areas. Instead of using only lava rocks or any other mulch all over the garden, combine different materials. A thorough knowledge of the garden, and movement of shade during different times of the year and day should be kept in mind while planning the use of mulch to make best use of its properties. Use of lava rocks is not complicated. Clean the area and ensure it is weed-free. If there are any roots or stock left weeds will grow through gaps in lava rock layers. Different amounts are recommended by NCCES (pg. 16), depending on size of plants. Go 2 to 4 inches around trees and shrubs, but stick to 1 or 2 inches near perennials. Keep your much at 1 inch around annuals. The mulch should not be close to the plants, nor should it be piled around the stem like a volcano, as excess water can collect, causing stems to rot or attract insects and animal pests. For instance, lava rock makes a good mulch on a slope because it is heavier than wood mulches, and is not washed away easily. The long-lasting lava rocks are especially attractive and useful in perennial beds or around shrubs, notes North Caroline Cooperative Extension Service (pg. 16). Lava rock is ideal for temperature moderation as the rocks release heat at night and this can be beneficial for plants in colder regions, says SFGate. This rock is lighter than other rocks used as mulch, so it is easier to work with. Lava rocks aren't the best possible choice of mulch because they don't add nutrients to the soil though they can make the soil hold water a bit longer. It is difficult and expensive to remove lava rock mulch notes SFGate. They can also damage lawn mowing equipment. It is difficult to add or remove plants in an area with lava rock mulch. If the weather is already quite hot, it is necessary to monitor the plants to make sure the soil is not getting too warm for them under the rocks. This negative turns into a positive when every bit of warm sunshine needs to be captured, however. Lava rock may even allow people who live in the north to extend their season a bit. Leaves and grass that fall on and between the rock mulch are difficult to remove, notes NCCES (pg.16). Lava rock's unique qualities should be kept in mind while deciding where to use it in a garden. Hallett Taylor recommends black lava rock saying, "I love the look of black lava rock with succulents, cacti, and native plants in drought tolerant and desert landscape design--especially when different sized rocks are used." She added, "The texture is beautiful and with some of the rocks you can tuck succulents into crevices with some tightly packed soil for an interesting effect." Lava rock is also suitable for rock gardens or herb gardens according to NCCES (pg. 16). Lava rock are suitable for areas with shrubs, but not with annuals where organic mulch is better. So kitchen gardens where soil is worked and replanting is a regular feature cannot use lava rocks. Lava rocks make for excellent contrast elements in island beds, suggests SFGate. The irregular and porous texture of lava rocks sets makes it an interesting variation to smooth pebbles, and be used to great effect together as decorative components. Keep in mind the different colors that lava rocks comes and use it as accent mulch or in containers. It can be an advantage and provide pleasing visual details besides being functional. Red lava rocks can be used in certain cases, keeping in mind Hallett Taylor's advice. It looks attractive as a background for deep green foliage and can add a tropical feel to the garden. Lisa Hallett Taylor suggests people take advantage of the different hues of the lava rock within their landscaping design. The area should be raked clean and levelled. Use a hose or string to form the outline and add the lava rock. The area should be edged to hold the rocks in place and prevent them spilling into lawns. Rocks applied should be two to four inches deep. Allow water to seep into the ground, which reduces rain runoff and prevents soil erosion, and therefore land and water pollution. Keep an area relatively weed-free, and so maintenance is easy, if used with a good landscape textile points out Hallett Taylor. Once applied, they can sink into the ground. It is difficult to clean leaves and grass from it, so it should be used in an area free of leaf-fall. The color of lava rock used for landscaping needs to be chosen with care, cautions Hallett Taylor. "When using it, also consider the architectural style of your house and the landscape design style," she said. Use black lava rock for "rustic, ranch, Mid-century modern, Spanish, or Southwestern style homes and gardens". Red lava rock should be used in regions where the soil is red, such as Utah and New Mexico, and in Southwestern landscaping. As a general rule Taylor prefers black to red lava rocks. Red lava rock is considered a disadvantage if a property is to be sold as the color stands out. Many people are replacing expanses of water guzzling lawns with xeriscapes covered with mulch. Lava rock is ideal as it does not need to be replaced often. 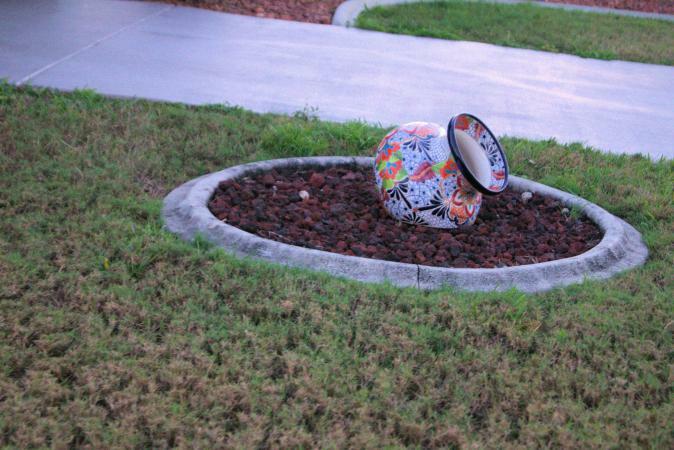 It is can be part of intelligent landscaping that is gaining popularity in response to modern concerns about sustainability or environment friendly lifestyle, especially in regions where drought is common. Even though the initial investment is more than for organic material, it can save water as well as money and time on the long run. To make pathways used alone or in combination with pavers. 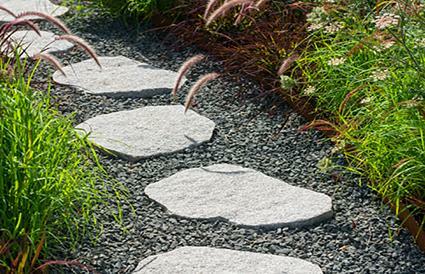 The color of lava rocks used in pathways can be chosen to either complement or contrast flower beds, and to demarcate walking ways visually. This rocky material is particularly suitable for Japanese designs as North Caroline Cooperative Extension Service points out (pg.16). 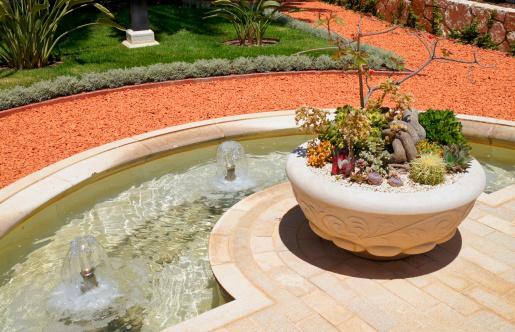 It can be used under decks, with water elements like fountains, or ponds. It is suitable as stones for a fireplace/fire pit in the garden. Use some large rocks of the same color or material to add interesting details in an expanse of mulch. These could be stand-alone elements or combined with solitary clumps of grass or bamboo. There is a growing trend to use large lava rocks as containers for succulents and other rock plants to create interesting detail in any garden small or large, or bring as indoor decorative pieces too. This irregular shaped rock with pointed edges is a great choice as an organic, chemical-free slug control because the nasty bugs cut their bodies up on the rocks and therefore can not bother plants. To be effective spread lava rock beyond the plant canopy and removing dead leaves or grass that could act as bridges for slugs. However, useful insects and worms can also be affected by lava rock. To control slugs in the kitchen garden where vegetables are grown or in flower beds with annuals, a border of lava rock on the periphery of the bed can keep slugs from entering the bed and getting near plants. When using lava rock as slug control, Hallett Taylor reminds that this can be useful only in areas covered by lava rocks. It maybe necessary to try other methods of slug control in parts of the garden without lava rock. As with many choices when it comes to gardening, deciding what kind of mulch to use is a personal decision. It is also based on the location of the garden, and plants that will be grown. An organic option like lava rock is a great one to consider.